Vet’ion is a Skeleton boss found within the Wilderness. As Vet’ion is a Skeleton, Vet’ion kills will count towards a Skeleton slayer task. Vet’ion also spawns 4 Hellhounds each time you kill him, so you can take advantage of a Hellhound slayer task. However, as Vet’ion is is also an undead creature, using a Salve Amulet is more efficient than using a Slayer Helmet. Only use a Slayer Helmet if you do not have the Salve Amulet. Vet’ion is quite a popular boss due to his high-value drops, although it is also a popular spot for PKers. Combine the threat of PKers with Vet’ions powerful attacks and this makes Vet’ion a rather dangerous boss. The best tactic to use at Vet’ion to maximise your kills per hour is to use Viggora’s Chainmace combined with a Salve Amulet. Viggora’s Chainmace gives a 50% attack bonus against enemies in the Wilderness and this stacks with the 20% attack bonus from the Salve Amulet – making them a very powerful combination. 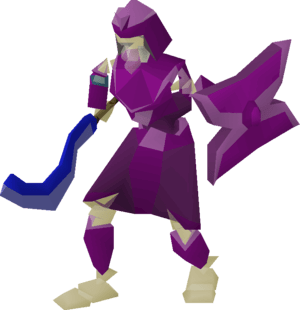 Using this setup, you want to use the protection from melee prayer. Vet’ion has two other attacks, the lightning attack and the earthquake attack. The lightning attack can be easily avoided by moving one square when you see it coming. The earthquake attack cannot be avoided and can deal up to 45 damage.